I get asked a lot about how I liked to cook my wild turkey breasts. My first thoughts are always turkey marsala and jägerschnitzel, but there’s an even more basic — yet fantastic — way to cook wild turkey breast: parmesan. 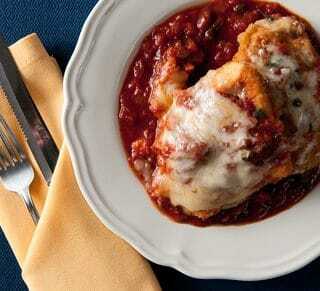 If you’ve never had chicken parmesan or veal parmesan, sorry, man. Someone doesn’t love you. It’s Italian-American comfort food at its finest. A hearty tomato sauce, lots of cheese and breaded, sauteed cutlets of meat. A chicken parm sandwich was in my weekly lunch rotation when I was a kid in New Jersey, and most of my Italian friends’ moms had their own version. Veal parm was fancier, and I mostly had it at restaurants. “Parm,” whether it’s chicken or veal or wild turkey or grouse or whatever, can be made with jarred sauce, industrial mozzarella and pre-grated parmesan in those ratty green cans. I’ve eaten it this way, and it’s still good — although I get the decided aftertaste of shame when I eat such a sterile version of this great dish. A really good parmesan (and yes, I know “parmesan” is a Frenchified version of the parmigiano) is, like all Italian food, dependent on the quality of each ingredient. Really good parm needs a freshly made sauce, fresh herbs, good, fresh mozzarella and real Parmigiano-Reggiano cheese. And the meat should be pristine. Like a cutlet from a wild turkey. Cutlets from a chicken, pheasant or grouse are easy; pound thin. Cutlets from a turkey require a little more work. For starters, all turkey breasts, wild and domestic, have a thin end and a thick end. I typically cut off the thin end and use it for another dish. That leaves the thick end, which is far easier to slice crosswise into slabs. Place each slab between pieces of plastic wrap and pound them to about 1/8 to 1/4 inch thick with a rubber mallet (what I use), a meat mallet or an empty wine bottle. If you’ve never made your own cutlets before, use about the same amount of force as you would knocking on someone’s front door. A solid knock: Not a tap, and not a hammer stroke. Work from the center of the meat outward, and constantly lay your hand over the meat to check how evenly flat you are getting the cutlet. Remember, the thinner the cutlet, the faster it cooks and the more tender it will be. But thin cutlets require practice to make without tearing the meat. Assembling your turkey parm is easy. 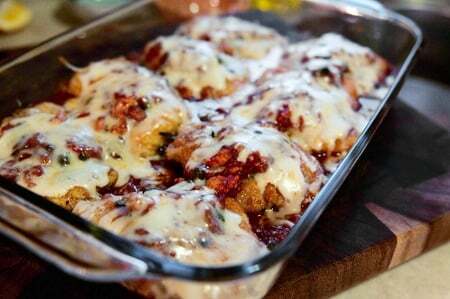 Dredge your cutlets in flour or breadcrumbs, saute them until they are golden brown, then bake them briefly in a bath of tomato sauce and cheese. How to serve? Normally you get it either in a sandwich or alongside spaghetti. But it would be good next to polenta, too. This is a basic parm recipe. 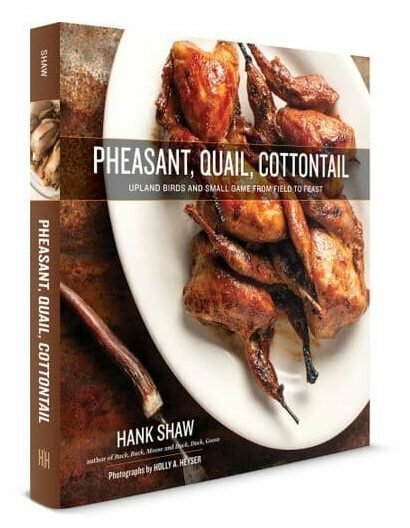 You can use the traditional chicken breast or veal, or you can do what I do and use wild turkey cutlets, or pheasant breasts. Do your best to not get too fancy with this: It's comfort food, and it doesn't need lots of extra ingredients. Just be sure to get the best quality cheese and tomatoes you can find. Make the sauce first. Heat the olive oil in a medium pot and saute the onions, stirring occasionally, until they are soft and translucent, about 6-8 minutes. Add the garlic and cook another minute. Add the tomato paste, mix well and cook for 3-4 minutes, stirring often. You want the tomato paste to darken to a brick color. Add the can of crushed tomatoes, the wine, the salt, red pepper flakes, sugar and the herbs. Mix well and let this simmer gently while you finish the dish. Start with slices of turkey breast about 1/4 to 1/2 inch thick. It doesn't matter too much how large the slices are, as you can cut them into serving pieces after you pound them flat. Put the slices between two pieces of plastic wrap, then pound them flat; I like mine between 1/8 and 1/4 inch thick. Mix the parmigiano cheese with the breadcrumbs. Salt the turkey well, dip into the beaten eggs and then dredge in the breadcrumb-cheese mixture. Heat the 1/4 cup of olive oil in a large pan and fry the turkey cutlets over medium-high heat until golden on both sides, about 6 to 8 minutes. While the turkey is frying, preheat the oven to 375°F. Find a casserole pan (9x13 is a good size) and lay down a layer of sauce. Put the cooked turkey cutlets on the sauce in one layer. 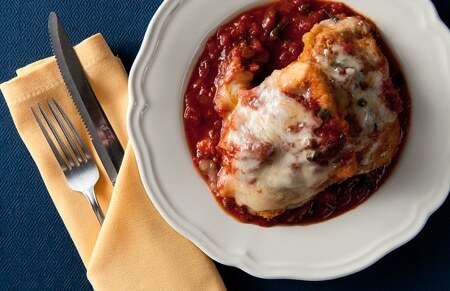 Lay down a little more sauce, then cover each cutlet with the mozzarella cheese. Bake in the oven until the mozzarella just starts to brown on the edges, about 12 to 14 minutes. Serve with spaghetti or in a hoagie roll. Hank: i have made wiener schnitzel with wild turkey breasts for years. Very good. Had some a few days ago. In upstate New York for fall turkey with our turkey dogs, The Boytel Retreiver. Gonna try your turkey parmesan tomorrow with a leaf or two of basil floating on top. Julia Child used to say that you could substitute turkey breast for any veal dish. Have personal access to a serious meat cutting operation where I make my wild turkey breakfast link sausage out of the giblets, thighs, white scraps and 40 % pork. Lightly smoked & showered for nice bloom. Very good and very rare, as in nobody else does it. If I knew how, I could send you a picture. Later this month, back in Georgia, where the very first doe will make a fine Chilindron! Super tasty recipe – nice comfort food on a chilly day. Thanks! Tried this awhile ago, the flavor was amazing. I felt like a gourmet cook, but it was easy to make. I should have made the cutlets a little thinner, but I will know that for next time.